Perhaps the best thing about Free Solo is that it doesn’t psychoanalyze its subject. The camera keeps just enough of a distance from Alex Honnold to respect a man who distances himself from much of everything around him. The man is one among very few – a free solo artist who climbs mountain walls without any support. The practice can result quite easily in falls, some of which can be more than 1,000 feet and most of which are deadly. At one point, news of the death of an acquaintance, the late Ueli Steck (who fell more than 3,000 feet after attempting to climb the West Ridge of Everest in April 2017), reaches Honnold. The climber’s reaction to his friend’s death is telling. We see no crying, and the immediate reaction to his reaction from one of his attendant climbers suggests that there probably weren’t any tears away from the camera, either. Honnold comes across as pragmatic to a fault: Steck, like himself, knew the risks. This doesn’t mean the man was responsible for his own death, per se, but he put his life in his own hands. Honnold understands the concept so well that it’s rather unsettling. He knows that, at any given point, he could fall, and whatever safety precautions he or his fellows might put in place will not be helpful. 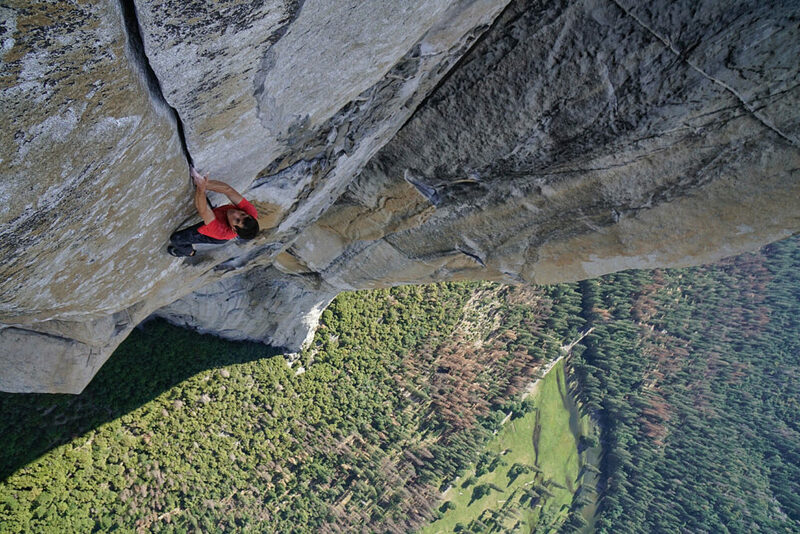 In other words, directors Jimmy Chin (a veteran of these extreme activities) and Elizabeth Chai Vasarhelyi (who seems to do most of the camerawork here) allow Honnold to come to his own conclusions – about himself, about his hobby-turned-career, and about their impact on his life. The usual biographical elements are almost secondary, although we learn that he might be on the autism spectrum and that he dropped out of college a year into it. He moved into his van, in which he now lives permanently, and met Sanni McCandless, his current girlfriend, at a book signing. She didn’t know who he was when she arrived, but the event ended with her giving her number to him. The main subject of the film is Honnold’s attempt to climb the El Capitán wall in Yosemite National Park in California. From base to summit, the climb is 3,000 feet. Much of the film’s dominant framing device is the preparation, the training, one failed attempt after bailing at a particularly hard spot on the climb, and the expedition itself, which is historic. There isn’t a lot of complexity to this structural approach, but the lack of nonsense in it mirrors Honnold’s own. He is quite the character – inexplicable even to those who are audience to his headspace. Free Solo is a serviceable and affecting tribute to that old adage about why people climb to these impossible heights.